Over the last one to two years a handful of automotive publications (including MotoringFile & BimmerFile) have been reporting that BMW intends to share platforms and engines going forward. And while we’ve known for some time the generalities of the plans, we’re starting to get a much a much better view of the future. For starters BMW intends on using a common platform to underpin up to a dozen cars for both the MINI and BMW brands. UKL as it’s known internally will handle all front and all wheel drive small car needs for BMW and MINI in the years ahead. In fact there are some that believe UKL will even be used for the next generation 1 Series after the F20 – yes that means a front wheel drive 1 Series. But that’s getting ahead of ourselves. Let’s talk about BMW’s first steps with the new platform. We want to grow in the premium small car and compact segment with the BMW and Mini, “explains Ian Robertson, BMW board member for sales and marketing, told the industry magazine CAR PRODUCTION. The logical step is therefore the extension down to a compact car family called UKL (lower compact car) that there is currently not in BMW and Mini. To close this gap, Robertson announced a product offensive. “We think about six to nine new vehicles based on this architecture UKL So a product family that our position in the arena of small and compact cars will expand massively. “Whether or not including a van to the model of a Mercedes A-Class are, the BMW manager replied: “We have analyzed in great detail, where is still room for more models. 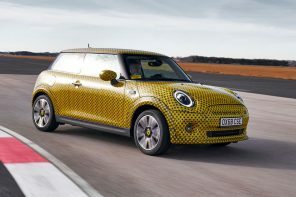 The first step will happen in late 2012 when BMW will release the 3rd generation MINI. Codenamed the F56 and replacing the R56, the three door hatch will sport completely new interior design (with improved interface design) and an evolution of the MINI exterior design language. Perhaps most importantly, there will be the new technology and powerplants. BMW will debut it’s new range three cylinder engines in the F56 that will ultimately go on to power much of the (approximately) 12 forthcoming UKL based models. Shortly afterwards will come the BMW version of the F56. Known internally as the 1001 the car will be offered in three and five door variations that will offer the same space and general performance of the F56 MINI. So how will BMW be able to actually give each car it’s own character? Reportedly BMW feels confident that software, design and marketing will be enough to make them each unique. This is clearly the big hurdle that we all question can be overcome. From there MINI will be going on to release the convertible and then the next generation Clubman on the UKL1. Ah yes, sources are now telling us that the next generation Clubman won’t be based on the current Countryman platform but actually the five door hatchback front wheel drive BMW. But don’t worry, the barn doors will stay. For those about lose count of what’s coming, it gets in murkier. The Paceman (essentially the Countryman Coupe) will make it’s way to showrooms in 2014 based off of the current Countryman platform. And then things get really interesting. Reportedly BMW intends to stretch the UKL to underpin the next generation BMW X1 and Countryman around the 2016 and 2017 model year respectively. Yes the X1 will go front wheel drive in standard form. 2017 will also see the production version of the MINI Rocketman. According to several sources (including this month’s Automobile Magazine) MINI may even go slightly smaller with the Rocketman getting very close to the original Mini’s length of 120 inches. At this time there are no plans for a BMW city car of similar stature. Reportedly on the drawing boards but unconfirmed by our sources are a BMW and MINI ‘sports activity tourer’ that will offer the most space and versatility on the platform. What they will ultimately look like we haven’t the foggiest. By 2018 BMW intends on rounding out the decade with the next generation MINI Coupe and Roadster based on the UKL. And alongside the much rumored BMW Z2 front wheel drive roadster. The Z2 will finally bring an affordable roadster to the BMW range. Although how it will market it alongside the MINI Convertible and MINI Roadster is yet to be determined. Finally there are several rumors (and at least one of our own sources) that are pointing the UKL serving as the basis of a front wheel drive 1 Series. Yes that would mean the F20 would be the last rear wheel drive 1 Series before the car moves over to what many BMW enthusiasts would consider the dark-side. However for those who doubt BMW’s prowess and building successful and sporty front wheel drive cars, just look at the last ten years of the MINI brand. There are other rumors but things frankly get a little too murky for our tastes to report yet. However suffice to say BMW intends on leveraging everything it can to combat VW, Audi and Mercedes over the next decade. And with lighter, more efficient (yet power engines) combined with a flexible and very high-tech platform, they stand a fighting chance.